I got this as an ebook when looking for another book on the Embroidery recommended by Hazel Uzzell. I got what she recommended, but I want to recommend this one! It was fascinating and well written, and I will be looking at other appropriate books by Hicks! 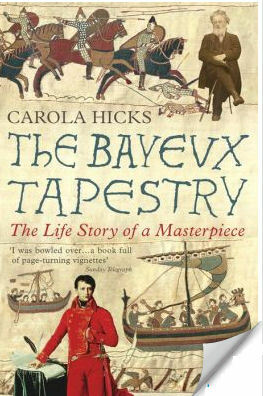 After an extensive chapter on the battle that inspired the Embroidery, Hicks comments at length on the reasons for the Embroidery, who originated the idea, who designed it and who did the actual embroidery, along with remarks on feminism connected to the process. There is even a very good chapter on the way in which embroideries—and therefore this was one—was done, going from design, transfer of the original artwork, manufacture of the raw materials and so forth. Fascinating for persons interested in medieval textiles even if they have little interest in this particular embroidery. At this point, the book features a largely chronological account of the history of the Embroidery. The first few centuries of the Embroidery’s existence are ambiguous. To a great extent, we do not know whether it was a gift, to whom it was a gift, whether it was given from the start of the Bayeux Cathedral and so forth. We know that the Embroidery was kept in a cedar chest in the cathedral and brought out for display for only one or two occasions each year. It is first mentioned in the fifteenth century, and its amazing series of adventures begin. Hicks compares it to a cat with nine lives, and its romantic and unbelievable exploits are more exciting than the best fiction. We are told of its travels, of its exploit with Napoleon and Hitler (both of whom wanted to use it as a symbol of the successful invasion of Britain), of its almost as dangerous encounters with people refurbishing it and its possession by one entity or another. We are told of its close escape in WWII, when Hitler sent SS men to bring it back to Berlin when Paris—to which it had brought—was in danger of falling, but a quick-thinking official was able to stymie the SS officers who never came back. And we are told of its various travels about the countryside that should have brought about its destruction. Hicks wonders if the fact that it survived was because of how it was made. Although made with a stitch used for gold threads, it is merely wool and so beneath the interest of looters looking for gold. While this is probably true, it does not deal with its other close escapes and redemptions. The Embroidery has had a dozen guardian angels or many many admirers who have worked to ensure its continued existence! Hicks deals with the reproductions—embroidery, sketches and photography—made over the years, including the seminal reproduction by Charles Stothard. Not only was the cover not accurate in many instances—the Embroidery was considered a primitive piece of artwork compared to current Renaissance standards, and he seems to have prettied up things a little, showing shadows and the such as he deemed fit—but Stothard did other questionable things, such as clipping off one of two pieces of the ragged ends (an act which was later attributed to his wife in what might have been an effort to keep his reputation intact) and an attempt to make a plastic cast of the Embroidery by forming a mold by pressing hot wax against the fabric. His errors were in many cases continued into the actual Embroidery itself; for example, the arrow in the eye incident that allegedly slew Harold was supposed to have originally been a spear over the character’s head but which was shortened, its trajectory altered and fletching being put on the end by Stothard. We are told of the reproductions and artistic efforts inspired by the Embroidery, and we are told at length of the best-known reproduction, the successful efforts of a group of English women from Leeks to embroider a copy of the embroidery—with breeches on the figures that assault moral virtue. They used naturally dyed wool rather than the chemical-dyed stuff used earlier to repair the actual embroidery, and as a result their effort is still vibrant today. The replica was toured—including apparently a visit to the United States—but never made the expected large profit, and was sold to the city of Reading, where it is on display yet today in a museum built especially to house it. Graphic reproductions of the Embroidery—of various accuracy—are included in many cases, and we are told of the questionable Victorian repairs, which was done not only with inadequate yarn but with inadequate knowledge, being based to a great extent on Stothard’s inadequate pen and ink reproduction. We are also told of the many photographic reproductions made, as well as the way that some of them were displayed—including affixed on a long sheet of fabric themselves—and the pains taken by many photographers as well as the damage that some photographers might have afforded by the constant rolling and unrolling of the Embroidery and by their flash bulbs. Besides the artistic and photographic replicas and reproductions we are told about the plays, the poems, the novels and eventually the films which were based on and inspired by the Embroidery. Hicks has added immensely to what we commonly know about the Embroidery, and she does it in a lucid, comfortable and well-written manner that adds much to the understanding of the Embroidery. I cannot recommend reading this volume if you have any interest in the Embroidery itself! Well worth the time and effort! The book is available as an ebook. This entry was posted on July 21, 2014 by folo1. It was filed under Uncategorized .